Like 14 million people across Canada  and 179 million Americans , I am in love with Halloween. I am so looking forward to dressing up in my costume, artfully decorating some pumpkins and eating way too many chocolate bars. Needless to say, Halloween is my favourite, sugar-fuelled, spooky holiday of the year. Similar to any great brand that has been able to stand the test of time, Halloween has adapted to countless trends and cultural beliefs throughout history. The staying power of Halloween is really quite remarkable, it’s a celebration that has been around for 2,000 years , and is more popular than ever. In 2016, its estimated that $392.5 million was spent on candy alone at Canadian retailers during the month of October . In America, sales for candy, in October of this year, are estimated to reach $2.7 Billion . Needless to say, Halloween has proven to be a profitable business as well as a successful cultural event. 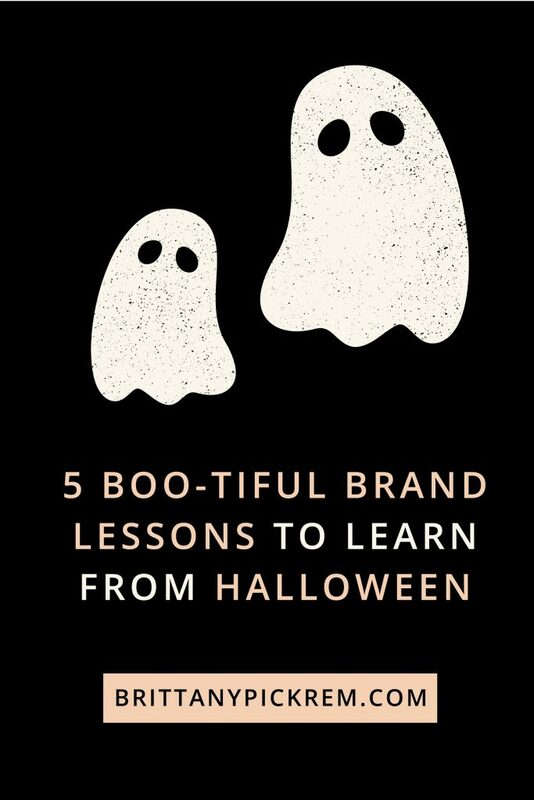 If Halloween was a brand, there would be some highly valuable lessons to learn from this holiday. I’ve listed a few samples that you can apply to your own businesses’ brand strategy below. Halloween has cemented its cultural and business relevance through constantly adapting. For example, Halloween first came into existence around 2,000 years ago as the ancient Celtic festival of Samhain (pronounced sow-in) to celebrate the end of summer and the end of harvest. By 1000 A.D., Christianity was so common in Celtic lands that the church replaced Samhain, with All Souls’ Day to honour the dead. This is an example of one of the earliest evolutions of Halloween. Although it was re-packaged into something that was palatable for people of that era, Halloween festivities continued to evolve and survive throughout the ages. Key brand takeaway: Embrace change as it comes. Be savvy of current cultural trends and movements. If you master how to make them work best for your businesses’ brand, you’ll remain relevant and in touch with the heartbeat of current cultural interests. Halloween has been entertaining and engaging the masses for centuries. This holiday has long been an excuse to have some fun and gather with friends. Halloween’s brand awareness is nearly global and its popularity is only continuing to grow throughout the world. Even parts of Japan are starting to celebrate Halloween! . Despite adversity, criticism and world events throughout the centuries, Halloween is a tradition that has been able to endure, in part, because of how fun it is. Key brand takeaway: Position your brand’s message so that it’s always as engaging and interesting as possible. Your message will resonate with your audience if you have interesting and fun ways of presenting your thoughts and ideas. Despite being around for centuries, Halloween is still relevant in today’s modern culture   . I believe that part of what has made Halloween endure is its spirit. If you think about it, this holiday has never really strayed from its core values and purpose – to gather, connect and celebrate with your community, to be entertained and to have fun. Key brand takeaway: Understanding the core values and ‘the why’ of your business means that you will never have to stray from them, even during times of change. Write down the values that your business was built around. These are the values that you should never be willing to compromise on no matter the changes that happen. The really wonderful thing about Halloween is that it is accessible and appeals to a large group of people. Anyone from 5 to 95 can get in on the fun of Halloween. Young or old, rich or poor, you are welcome to enjoy the festivities. Because Halloween has been re-packaged again and again over the centuries, it’s easy to repurpose this holiday in any way that fits your lifestyle. Key brand takeaway: I’m not saying that your brand should necessarily appeal to as broad an audience as Halloween does, in fact, it shouldn’t. However, it never hurts to have a brand that generally feels approachable and friendly. Breaking down perceived barriers can open doors to finding your dream clients and producing your very best work. When I think of Halloween from a visual perspective, it has highly recognizable imagery that has become symbolic to its brand. What imagery do you think of when you think of Halloween? I can almost guarantee you that likely think of jack-o-lanterns, skeletons, orange and black colours or bats. 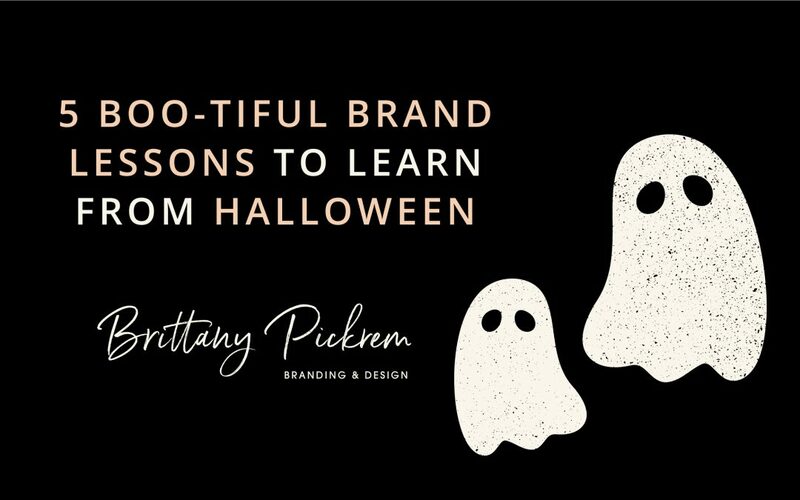 Halloween is an example of incredibly successful visual branding because we all know what it looks like. Halloween has been consistently showing up year after year with the similar visuals. Key brand takeaway: You must be intentional and consistent with how you show up across all of your businesses’ marketing materials. Using the same imagery, colours, fonts and graphics, consistently, allows your brand to be distinct and to stand out from the competition. It also helps build brand recognition for your business to potential customers. Your brand should be just as recognizable to your customers as Halloween is recognizable to you. Wishing you all you ghouls and goblins a safe and spooktacular Halloween! Haha, so glad that you enjoyed this post Crystal. Wishing you, Jason and kitties a very happy Halloween!